Starting a thread for the Lemon Garlic OG x Starfighter testers sent out by @LED_Seedz. Anyone who is growing out this strain can post updates here. @LED_Seedz do you have any info that you'd care to share about either of the parents to start us off? Copy and paste from the other thread. Lemon Garlic OG is a seven-generation isolated selection of the original Southern Humboldt OG Kush has become an underground phenomenon amongst the elite growers and producers of the Northern California scene. This has resulted in the release of this phenomenal new strain, with a wild flavor profile, better known as the Lemon Garlic OG. 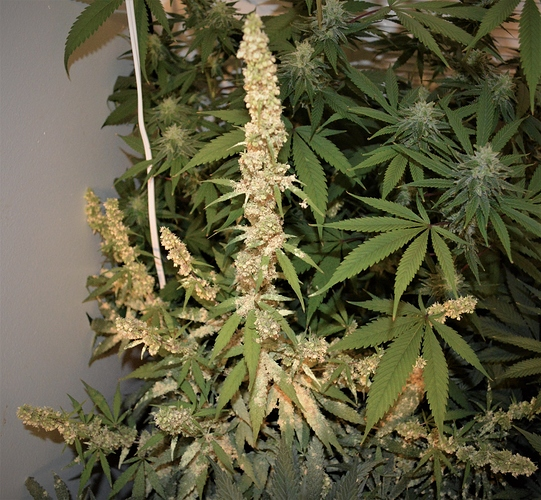 It was a collaboration of California Kind Genetics and Humboldt seeds. Your team mates are @MadScientist and @Swampthing and this one is completely un tested. Best of luck to the three of you! I will strive to excel. Thanks so much @LED_Seedz for the trust and good will. My teammates, @RickSanchez and @Swampthing, greetings! Still waiting on the beans, but they will make it and get popped instantly! Few more pictures of momma I found. @JaxxMunster if you could also run in this thread with these guys it would be most appreciated. I am glad to inform i will be taking part of the tester for this team, given the seeds arrived today. And then there was one. Hopefully that donkey makes it to Mexico soon. Good luck MS, and if ya mess up, I sent extra's, lol. I got 24 seeds, yes, but in the opening process one got sliced. OOOOOPS! Anyway, They are being popped in a few days, i won't even wait till the first! My mailbox is the ground anywhere around the front door. Nothing yet, but because of the holidays It is probably slower than normal. Good news is that letters always arrive, they just take forever. That is interesting to hear. I am going to set 10 right now and check germ rates. I'll report back what I find. 12:40PM EST seeds were set directly in to Rapid Rooters and under a dome under a 4300K LED. Room temp is maintained at 82FH. Yeap, 26 seeds it is... HAHAHAHA! Wanted to report I have 8 showing and the two remaining both have the tap roots out after 5 days. A little slow, and 2 did not shed their seed casing and needed help but I am not tripping now. Thinking I may just go ahead and run these through and get the F2's done. Smoke umm if ya got umm! Best of luck @MadScientist Be interesting to see if pre soaking helps shed their shells any easier. Their casing seems a little on the thick side. This is the way i germinate all my seeds, i have around 95% success, because i started practicing gemination for a long time before attempting to grow. It´s all documented in here. My first attempts were a shot in the dark but i hope not to let you down brother! I've read one way to deal with hard covered seeds is to put a striking strip from a box of matches into a match box with the seeds and shake the seeds in the box to rough up the outer shell giving the seed way more surface area for the water to soften the shell so it's easier for the plants to shed those tough shells....... I've been successful so far using my finger nails.